*If you don't have Acrobat Reader, visit the Adobe site to download the program so you can read these files. We have made copies of the interrogation records of Hoon Owyang and Gee Chiu Lin Owyang from the National Archives and Research Administration offices in San Bruno, CA. They have been converted into Adobe Acrobat* files. Sumas document 1 that includes Hoon Owyang's questioning when he arrived in Sumas, Washington in 1905. Most of the questions were about the stores in which he worked or had a share in Heung Shan (now Zhongshan) and Canton (now Guangzhou) when he lived in Tai Ling village (also Dai Lian). Some of the documents are cover sheets written in 1919 that accompanied the file back to Sumas from Angel Island. Document 2 includes the papers approving Hoon Owyang's admittance as a merchant. This file includes a photograph of his Certificate of Merchant; the original is approximately 3' by 2'. In 1916, Hoon Owyang returned to China and had to answer questions in Courtland, California, where he had settled by now, about his merchant status in the U.S. before he was allowed to leave the country. Included were his partners in the Kwong Chong Chan Co. He had to have two or more "credible witnesses other than Chinese" vouch for him in these papers, which include a photo of him. They included the area blacksmith and a contractor and deputy sheriff. 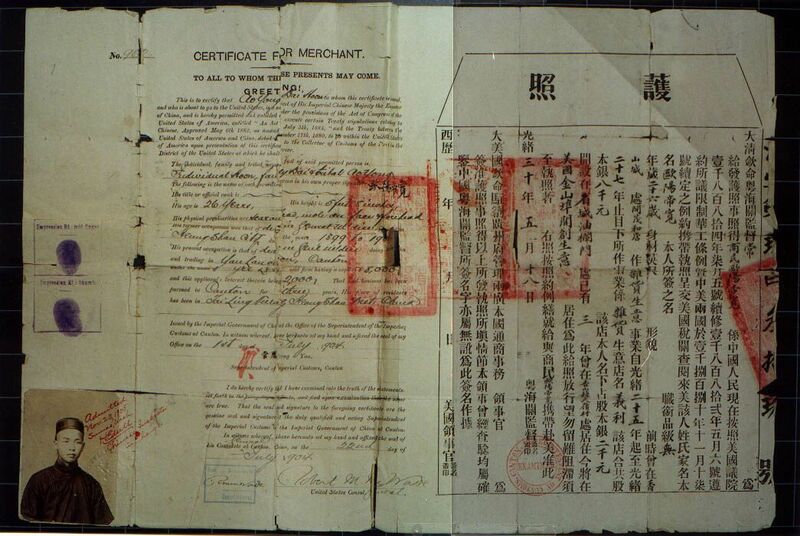 In 1919 when he returned, Hoon Owyang received this Application and Receipt for a Certificate of Identity. On August 27 and 28, Hoon Owyang was questioned about his village and his alleged wife and son. As a matter of fact, his "son" was actually his nephew, one of many paper sons who came to this country. He also received some corroborating witnesses, including Owyang Luk, a.k.a. Owyang Hoy Chong. He brought his wife Chew Chiu Lin Owyang, who arrived August 19, 1919. She was questioned on September 2 and 3, 1919. This file also includes questions of corroborating witnesses for Hoon Owyang's merchant status. The Action Sheet showed that Chew Chiu Lin Owyang was admitted on September 3, 1919. This document is Hoon Owyang's documentation to verify his admission to the United States in 1919. He evidently needed to get this form in 1947, before he returned to China a second time. When he was there, he got remarried (his first wife, Chew Chiu Lin passed away in 1934 at the age of 49). He returned to the US on November 1, 1949 aboard the SS President Cleveland, according to the passenger mainfest. In early 2008, a digital copy of the A-file for Hoon Owyang arrived upon request from the National Archives repository in Missouri, after we filed a Freedom Of Information Act form. According to Daniel Nealand, "Under the Alien Registration Act of 1940, all aliens in the United States were required to register with the Immigration and Naturalization Service (today the U.S. Citizenship and Immigration Service). Investigative files created for every alien registered were called Alien Registration or A Files. In the 1950s, INS headquarters decentralized and consolidated A Files with many older files at its field offices. Beginning in 1956, records of any active INS investigation were "uploaded" into A Files." To find out more about these Alien Registration Files and Mr. Nealand's article, see this article from Chinese America: History and Perspectives.